Ms. Erica Enders a “Pro-Stock” driver in NHRA, recently had A Better Tripp, during the “Spring Nationals” in Baytown, Texas. Charitable Donations Mark A Better Tripp’s Corporate Culture With 2008 now infamous for its sharp economic downturn, supporting charities was not foremost in people’s minds. But even in the midst of the gloomy economic climate, A Better Tripp opened their hearts, their pocketbooks, and their company resources to lend a helping hand to some very deserving children. A Better Tripp® Moving and Storage Co., Inc., Receives Better Business Bureau Honor Houston's premier moving and storage company has achieved one of its greatest honors to date: the Better Business Bureau's Award for Excellence. A Better Tripp Carries a Truckload of Christmas Joy For the fourth consecutive year, A Better Tripp Moving and Storage Company teams up with a local Houston church and a nationwide charity organization to make Christmas dreams come true. 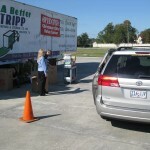 Local Houston Moving Company Offers A Better Tripp for Children For the second year in a row, A Better Tripp Moving and Storage Company joins a local Houston church and a nationwide charity organization to help fulfill the Christmas dreams of millions of children throughout the world. On the Move with A Better Tripp Moving & Storage Company No weight requirement and new higher frequency means clients enjoy a faster turnaround for small nationwide shipments.